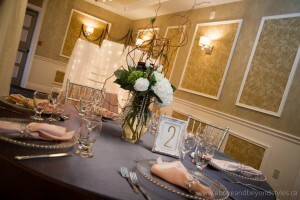 We have been busy planning and organizing the second annual Beyond Beautiful Bridal Show, hosted by Stratford’s Festival Inn. We are very excited for you to come and see all the fabulous vendors we have participating in this wedding show! 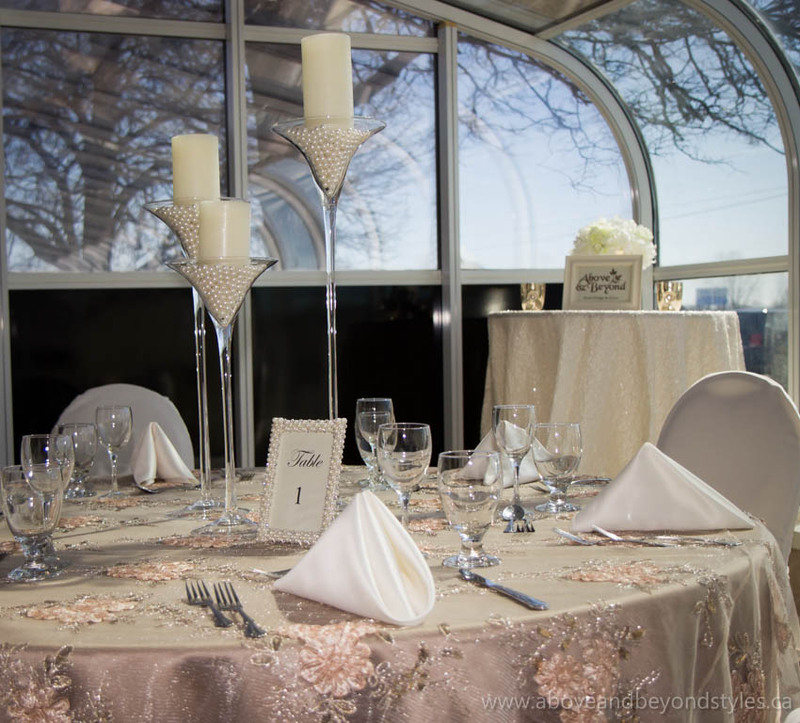 This year’s bridal show is taking place on Saturday, March 19th from 12 pm – 4 pm. Stratford’s Beyond Beautiful Bridal Show is one of the most unique wedding shows in Huron and Perth County. The inspiration for this show came from Above & Beyond owner Kim Foster. Read her blog post for all the details. The bridal show features two fully decorated halls to help you visualize all the elements of your own big day. We also utilize all of the Festival Inn’s common areas to showcase a variety of exhibitors that will be happy to speak with you about every aspect of your wedding day or special event! This is a very interactive and visual wedding show. In addition to the decorated halls, there will be delicious food tastings, wine samplings, wedding dress fittings, music, and live demonstrations. There are also wonderful door prizes to be won, and many draws to enter into! Click here to pre-register for FREE admission for you and all of your guests! Otherwise, $5/person at the door. 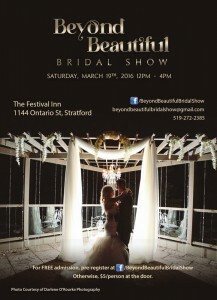 You can also reach the bridal show by e-mailing beyondbeautifulbridalshow@gmail.com or 519-272-2385. Be sure to follow us on Facebook to get all the current vendor details and bridal show information! We recommend reading our Bridal Show Tips: A Guide for Brides for tips and tricks on attending wedding shows, so that you are fully prepared to enjoy this extraordinary experience. 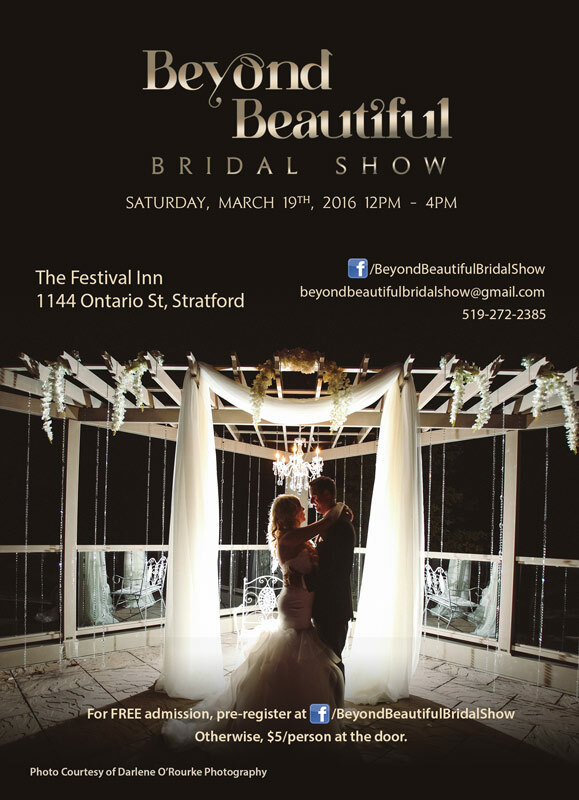 We can’t wait to show you what we have been planning for Stratford’s 2016 Beyond Beautiful Bridal Show!